A look at the country's rich cultural history and the legacy left by Latin America's longest-ruling dictator, Gen. Alfredo Stroessner. 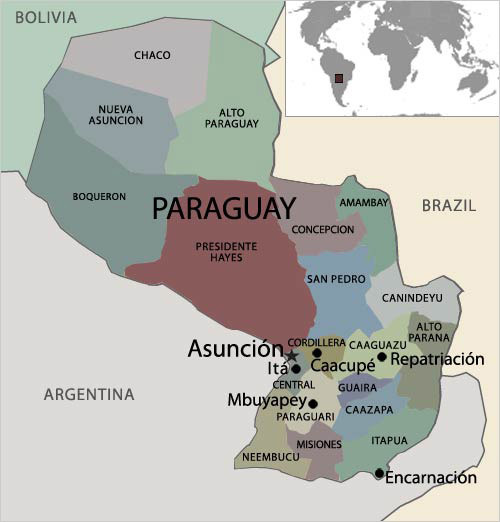 The name for Paraguay, a country the size of California located in central South America, comes from the native Indian Guarani words for "palm," "crown" and "water." Wedged between Argentina, Brazil and Bolivia, the landlocked country has significant rivers and lays claim to the world's largest working hydroelectric power plant. Located on the Parana River, the Itaipu Dam generates nearly all of Paraguay's electricity; resources are shared with neighboring Brazil, which financed the project. Paraguay's diverse terrain ranges from grassy slopes in the east to the marshes, lagoons, dense forests and jungles of the Chaco region in the west. Most of Paraguay's 6.5 million people share a mestizos or mixed Spanish and Guarani Indian heritage. The indigenous Guarani culture was heavily influenced by the arrival of Jesuit missionaries in the 1500s, although pockets of their culture still remain today. Paraguay has retained its native Guarani tongue as the national language. The seminomadic Guarani people originally lived in the eastern part of Paraguay and crossed paths with Europeans in the 1520s. The first European explorer, Sebastian Cabot, sailed up the Parana and Paraguay Rivers in 1524, but no settlements were established until 1537, when Spanish pioneer Juan de Salazar discovered an ideal spot in the site of the present-day capital of Asuncion. A flourishing colony developed, where the Indian population mixed harmoniously with the newly settled Spaniards. In the early 1600s, Jesuit missionaries arrived from Spain and Italy, looking to create a Christian republic in Paraguay. During this grand post-Renaissance social experiment, the majority of the Guarani Indians were converted to Christianity. Today, the country is 90 percent Roman Catholic. The Spanish encouraged the spread of the missions for more than just religious purposes. Since the mid-1600s, Portuguese slave traders from Brazil had been moving deeper into Spanish-held regions, and Spain needed to protect its bountiful territories. The idea of strategically placed missions proved an easy sell to Spain's rulers, who saw a political advantage in building Jesuit missions. During this period, the Jesuits built around 30 missions across Paraguay and Bolivia, in a region nestled between Spanish-controlled Argentina to the south and Portuguese-controlled Brazil to the north. The region was a perfect buffer zone between two formidable colonial powers and a self-sufficient refuge for Indians, who were put to work building missions and working the land. The Jesuits were so successful at building and sustaining civic life in this region that they operated virtually independent states. In the indigenous settlements, called "reducciones" in Spanish, the heart of mission life was a church, a college and yard built around a wide square. The houses of the Guarani Indians faced three sides of the square, and some of the reducciones were home to communities of 20,000 or more. As centers of learning, the Jesuit reducciones introduced the indigenous population to European art, wood-carving and baroque music, and many Indians became expert musicians, as each church founded its own orchestra. The Indians also learned how to make their own instruments in workshops. In the 1750s, Spain ceded a portion of the mission territory to its rival power, Portugal. Portugal's desire for greater economic control started a war with the Guarani, in which the Indians were defeated. The European powers also wanted control of the Indians protected by the missions, and Spain ordered the expulsion of the Jesuits in 1767. Many missions were abruptly abandoned, and the Indians returned to living in forest settlements. With designs on expanding its territories in the 1860s, Paraguay entered into the most disastrous war of its history. Between 1865 and 1870, Paraguay battled Argentina, Uruguay and Brazil in the War of the Triple Alliance, which claimed the lives of more than half of the population. From a population of 525,000, the country was left with only 28,000 men. 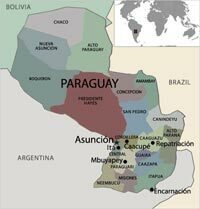 Paraguay went to war again in the 1930s, when it fought a successful war with Bolivia for rights to the Chaco region, falsely believing that the area was rich in oil deposits. After 27 years of political volatility, during which the country saw a succession of 22 presidents, few of whom could stave off the next coup long enough to provide any political stability, a near-bloodless military coup in 1954 catapulted Gen. Alfredo Stroessner to power. During his 35-year reign, he inflicted torture and misery on his population and murdered thousands of political opponents. His oppressive regime turned Paraguay into a nation bitterly divided between the rich and the poor. Under his military dictatorship, which kept the country in a perpetual state of "siege," Stroessner remained beyond the law and used his secret police to suppress any political opposition. During the 1950s and 1960s, Paraguay became a safe haven for Nazis and other war criminals. The 1970s marked a particularly brutal time of political killings and imprisonments. Despite Stroessner's notorious human rights record, the United States backed his regime. South America's longest-running dictatorship came to an end in 1989, when a military faction seized power, sending Stroessner into exile in Brazil until his death in 2006. For many, his legacy is remembered as a system consumed by corruption and a population conditioned by fear. Years of political uncertainty, corruption and a poor infrastructure have meant that about 60 percent of Paraguayans live in poverty. The vast inequality in land ownership has led to many tensions between the elite and poor in the country. About 1 percent of the population owns 77 percent of the land. Although the economy remained tightly controlled under Stroessner's regime, the Paraguayan government has kept it deregulated since 1989. While the country experienced slow but steady economic growth in the 1990s, the financial crisis in Argentina spilled over into Paraguay, which also negotiated emergency loans with the International Monetary Fund. The re-export of imported consumer goods to neighboring countries and the activity of street vendors make up a large part of Paraguay's current economy. The absence of mineral wealth means that Paraguay relies heavily on agriculture, mainly cattle ranching. In recent years, Paraguay has joined other South American nations in promoting a continental free trade zone. The presidents of Paraguay and neighboring Brazil, Argentina and Bolivia, along with other leaders, attended a South American summit to support free trade in 2005. A firmer exchange rate and greater confidence in the current president, Nicanor Duarte Frutos, have bolstered the country's economy since his election in 2003. Duarte Frutos, a grassroots politician and member of the ruling Colorado Party, served as education minister in the 1990s. Duarte Frutos' policies are more left-wing than those of previous leaders from the party, which has ruled the country for 60 years. During his presidency, he has reached out to other Latin American left-leaning nations and recently defended the leadership of Venezuela's Hugo Chavez and Bolivia's Evo Morales. Duarte Frutos' failure to end crime and corruption and to create new jobs, as promised in his campaign, has drawn criticism and even an assassination attempt. However, he has pushed for reforms in the country's Supreme Court and replaced cabinet members after a corruption scandal. The president hopes to change the nation's constitution so that he can seek a second term in office next year. Sources: CIA World Factbook, Financial Times, The Guardian, The New York Times. The Sonidos de la Tierra (Sounds of the Earth) program was founded by Luis Szaran to teach classical music to some of Paraguay's poorest children. The art and education program began in 2002 and has grown to include more than 3,000 participants in urban areas and remote villages nationwide. The Skoll Foundation helped fund the Sounds of the Earth program. Read more about the musical program's founder, Luis Szaran, in the foundation's newsletter. Szaran is the eighth child of farmers in Paraguay, who went on to study music in Europe under the tutelage of master classical musicians. He now shares his love of music with the children of Paraguay. Visit the Skoll Foundation Web site to learn more about other international projects supported by the foundation. The fund was set up by former eBay president, Jeff Skoll, in 1999 to invest in social entrepreneurs who are using innovative ways to bring about systemic change in underserved communities around the world. Check out other FRONTLINE/World stories focusing on the work of social entrepreneurs, from India to Uganda and South Africa. Read more about Jesuit mission composer Domenico Zipoli on the Tesori Musicali Toscani Web site. The organization promotes 16th- through 18th-century musical compositions from the Italian region of Tuscany. Zipoli, who was born in Tuscany, studied classical music in Florence, Naples and Rome before going to South America to spread his music through the missions. This comprehensive timeline details important events in Paraguay's history, from the arrival of the first European explorers in the 1520s to the death of former dictator Alfredo Stroessner last year. This New York Times article profiles the brutal reign of former Paraguayan president Alfredo Stroessner, who ruled relentlessly for 35 years. 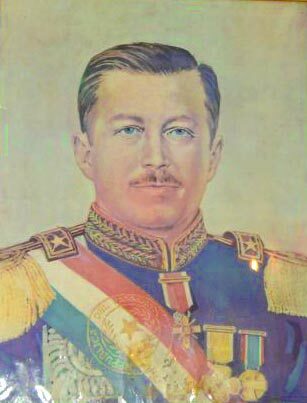 Stroessner died last year while in exile in Brazil at the age of 93. This article from The Guardian includes intriguing facts about this landlocked nation. Paraguay isolated itself for much of the 1800s, and novelist Augusto Roa Bastos described the country as "an island surrounded on all sides by land." This site details the history of the Jesuit missionaries, who founded reducciones (settlements) in Bolivia, Argentina, Brazil and Paraguay. The missions of the Chiquitos are the only ones that survive today. The Jesuit missions of La Santisima Trinidad de Parana and Jesus de Tavarangue in Paraguay were named World Heritage Sites by UNESCO in 1993. This obituary published in The Washington Post chronicles the life and rule of Paraguay's notorious dictator, Alfredo Stroessner, who died in 2006 at the age of 93. In this recent CBS Sunday Morning report, 60 Minutes correspondent Bob Simon travels to Bolivia to discover that the baroque music brought over by the Jesuits in the 1600s is still a vibrant part of the culture today. John Dinges� book explores "Operation Condor," a coordinated effort by Chile, Paraguay and other right-wing Latin American regimes in the 1970s to eliminate real and imagined leftist political threats. Operation Condor was supported by U.S. intelligence agencies.